At the 11th hour, Nike just simply couldn’t let Kevin Durant walk away. With Durant on the verge of a move to Under Armour, sources told ESPN on Sunday that Nike has exercised its right to match any rival shoe company’s offer to the Oklahoma City Thunderstar. Over the next two years, Kevin Durant will make more from his deal with Nike than he will from the remaining $41.2 million on his contract with the Thunder, according to sources. But on Saturday, Nike officials told Durant and his team at Jay Z’s Roc Nation Sports that it would indeed step up enough to allow the world’s largest shoe and apparel company to keep him in its robust stable of basketball endorsers that includes LeBron James and Kobe Bryant. While the exact Nike offer for Durant isn’t known, sources told ESPN that Durant should make more — in base and royalties — than the Thunder will pay him over the next two seasons ($41.2 million). That’s why fans in Oklahoma City were nervous about a possible move to Under Armour, which could have steered him more to returning to his local roots to play for the Washington Wizards when he becomes a free agent after the 2015-16 season. Analyst Omar Saad, senior managing director of ISI’s luxury, apparel and footwear team, who covers all the major brands on Wall Street, said that, despite the negotiations coming down to the final hours, he always believed that Nike would win Durant’s services. Saad said, for Nike, Durant satisfies a niche that makes him different from James, Bryant or the Jordan brand. Durant’s signature “KD” shoes generated $175 million at retail this past year, according to SportsOneSource, a market retail tracking firm. Not only was the business on the rise, but one retailing source told ESPN that Nike left plenty of money on the table with Durant’s shoe at $125 and relatively limited distribution to stores. Simply raising the price and opening up more channels could make the deal worth it, the source said. It looks like Nike has offered enough to land Durant, though it could be argued as to whether its an exact match to the Under Armour deal. Under Armour’s offer included 10 percent stock, which one could argue makes that offer worth more than its present day value. Indications were strong that Durant would go to Under Armour, which was essentially willing to commit more than eight percent of its annual marketing budget solely to the basketball star — and that doesn’t even include the marketing the company would do to promote the relationship. The deal with Durant would have largely trumped Under Armour’s largest sponsorship deal, surpassing the $16.5 million a year the brand pays soccer club Tottenham for its kit rights. But Under Armour CEO Kevin Plank believed that landing Durant would be essential to competing, not only in the basketball shoe space, of which it only did roughly $30 million in business last year, but in building the brand internationally outside of North America. Under Armour was further motivated to put a huge deal on the table thanks to the fact that Durant was a native of Maryland, having grown up in Seat Pleasant — less than 40 miles away from Under Armour’s Baltimore headquarters. Durant was a loyal Nike man, who took significantly less money to go with the company over Adidas when they both wooed him his rookie season. But considering the business that Durant became in the last two years, shoe business insiders were shocked that Nike didn’t try to lock him up before he became a shoe free agent. Nike frequently signs its stars to new deals before their current ones are up so that they can’t test the marketplace. That might have cost Nike more in this case, though it’s still a drop in the bucket to the company, which expects to sell more than $27 billion in product in 2014, making it more than nine times Under Armour’s size. 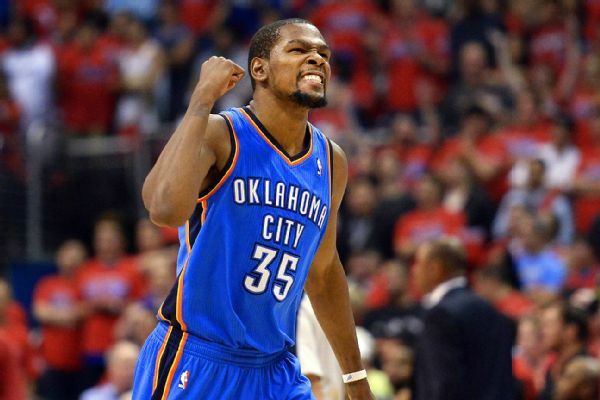 Although the money was big, sources close to Durant say the decision weighed on him. Going back to Nike comes with a sense of relief, those sources said, because Durant, who has turned into one of the league’s most marketable stars, can still make significant money without being associated with the risks of Under Armour’s fledgling shoe business. For Nike, consumers can expect to see a seamless transition, as Nike had so much in the pipeline for Durant because it believed it would keep him long before Under Armour shocked the basketball world with the nature of its offer. Nike has used its “KD” logo since 2008, but was granted the trademark for it in January. For Under Armour, it’s back to the drawing board. Last year, they wooed Golden State Warriorsguard Stephen Curry away from Nike, but have missed on Los Angeles Clippers forward Blake Griffin, who returned to the Jordan brand, and now Durant. Florida State is now on the board for the Class of 2015. 6’6 shooting guard Terance Mann, Tilton School (NH), announced his decision to verbally commit to the seminoles. Secondary ball handler, who is able to get into the lane and create for others. Mann has great upside with continued development, Mann has a chance to be a a big time combo guard. Defensively Mann cause havoc because of his length and ability to finish in on the break. With an improved jump shot Mann will be able to create mismatch oppurtunities in argubley the best confernece in the country ACC. Boston’s Best 40 took place at the Reggie Lewis Center in Boston; over 100 players from grades 5th- 10th took part in the summer’s ending events. The 3 point foundation (Andrew Mirken) assembled some of the best staff in the country, Anthony Gurley (UMass Boston) Kyle Casey (Harvard University) Dennis Clifford (Boston College) Corey Lowe (Boston University) just to name a few. The one day clinic started with drill stations which where intense from start to finish. Then there was a brief staff vs. staff game that brought the campers to their feet, followed by games and an all-star game. These are the players that stood out during the course of the camp. Javon Taylor 2017 (Beaver Country Day) – The recent Providence College commit showed off his scoring ability during the all-star where he was also relentless on defense. Taylor stands at 6-foot-3 now but expects this guard to not grow physically but also his skills on the court. Ulyen Coleman 2017 6’5 Combo guard Coleman shot well from the outside. Coleman also impressed with his ability to create off the dribble. Jakigh Dottin & Daniel Rhyner (2017 CR&L) – The pick roll tandem will be teaming up a lot the next three years for the Falcons. Dottin, an explosive lead guard who has shown a vast improvement in distributing the ball and making high level plays. Looking more confident in taking a pull up jumper but his bread and butter is his ability to attack the basket at will. Rhymer at 6-foot-5 is bruiser who is built like a defensive end. Daniel has a great motor, beats his opponent to the spot and physical style of play that allows him to dominate on the boards. Shyheim Hicks 2017 (Commonwealth Academy) – Hicks, a combo guard who is dangerous in the open floor. Has always been known to score in bunches but on this afternoon Hicks was playing the role of a distributor. Shyheim was able to find the open teammate and make the right plays. Julian Mincey 2018 6’9 and continues to develop his skill set. Mincey has a great deal of potential, but needs to work on his conditioning. Mincey showed the ability to efficiently use his size in the paint. Isiah Gaiter 2018 6’2 G very aggressive attacking the basket and also showed the ability to defend at a high level. Gaiter is an elite athlete with tons of potential. Kyle Rocker 2020 One of the best shooters in the class, Rocker has great range on his jumper and has gotten a lot better on the defensive end. During the event he showed he could put the ball in the basket, a great IQ with good size for his age group. Preston Murphy 2021 New to the circuit the young Murphy showed that he was hear to stay, showed that he has a high ceiling. During drills he showed the separation from him and his peers by going full speed in all drills. Once the games started the lights came on and Murphy displayed why he is one of the best 2021 point guards in the northeast. Boston’s Premier End of Summer Event will take place Saturday August 17, 2014 @ Reggie Lewis Center Boston Ma, grades 5th-10th. Remember the name Tyonne Malone. 6’4 SG with unlimited potential. Malone starred with the Mass Rivals 15u team throughout this past AAU circuit. Malone dominated the competition and made his statement as one of the top players in the country in the class of 2016. Malone uses his athleticism,size and strength to out play his opponents. Look for Malone to play a huge role where he is currently enrolled at Williston Northampton Prep School. – The best part in the program is when we travel to places like las vegas and to be choosen to play with this aau program. – My dream college is UCONN because i was born in Hartford and its a nice school there a good basketball team and all they do there is attack the rim and thats what I’m good at. 6’4 Swingman Quandarious Roberson had a breakout season last spring/summer while running with Expressions Elite. Roberson started on the Expressions 14u squad and earned many all tournament team mentions. The Mobile, Alabama native has a plethora of skills and has shown improving perimeter work as well. Roberson has reclassed to the Class of 2017 and is currently ranked #4 in New England. Look for Roberson and his running mate Kimani Lawrence to break out in the national ranking scene as both players will be starring with Expressions Elite 14u during this up and coming winter season. I play for Expressions AAU Program The best part was traveling and playing new competition. My strong points are going harder when a game gets mental and more physical. Marcus Zegarowski had quite the productive summer while playing with his Expressions Elite team. Zegarowski is a pit bull defender who has blossmed into a top notch floor general. Zegarowski continues to improve and was playing his best basketball towards the end of the summer. Zegarowski credits much of his success to his daily workouts with his father(Zach Zegarowski) as well as his older brother Michael Carter- Williams who currently plays for Syracuse. It looks as if Zegarowski could follow in his older brothers foot steps. I want to get a degree in broadcasting and be a coach for college basketball. 6’1 SG Matt Donahue was born with a basketball in his hands. Donahue comes from a long line of brothers that are exceptional basketball players. Sam and Jackson Donahue are currently receiving Scholarship level interest. Donahue being the youngest of the family could be the best of the brothers. Matt Donahue has displayed high level shooting range and performances including 9 threes in a half. Donahue continues to improve as he was playing his best basketball towards the end of the aau season with the RI Hawks. -Rhode Island Hawks and getting to meet new people, and the coaches helping me get better and improve my game and giving me the chance to play for their team. – I haven’t planned on visiting preps schools. The only one I’ve visited is NMH because my brother goes there. – Shooting and playing team basketball, and being a leader on the court. – Handling the ball, and getting quicker feet. – Kevin Durant, because he can shoot the ball, but doesn’t have a lot of body strength but can still compete against any type of competition. – NBA TV, ESPN, and Entourage. – Jordan 2011’s, Huaraches 2k4’s. 6’0 Point Guard Charles Fisher hails from Waterbury, Connecticut. Charles had a productive previous aau season while running with CBC. Fisher has shown tremendous court vision and prominent poise as a floor general. Fisher was last seen dominating the competition at the NERR Jr Prospect Academy earlier in August. Look for Fisher to make an immediate impact at St Josephs high school this up coming year. – Game day music is nothing I just go on the court and play strong and hard!